I had a blast judging pie at last weekend’s Pi Day festivities in Princeton. We gathered at the Nassau Inn, a few of us “pros,” and a few (very!) knowledgeble food folks from the local community. We pros judged the five pies that the restaurants and markets created, while the others judged the ten (!) 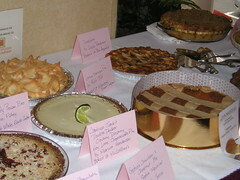 pies that were submitted by home cooks (those were prepared in restaurant and market kitchens, too). 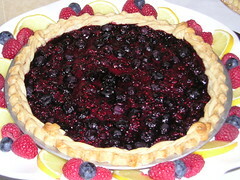 This one was submitted by the the Whole Earth Center, with a vegan crust and a filling of blueberries and raspberries, that was just lightly sweetened. Notice the adorable rosetts on the crust, that was a really nice touch. The next photo is of some of the home cooks’ pies and they were amazing! One of them (rear, 2nd from right) is the lovely crostata from Linda Prospero, whose blog, Ciao Chow Linda is a favorite of mine. This was submitted in honor of Linda’s friend Alessandra Mazzucato (it is her recipe), who recently passed away. A crostata is a pastry shell filled with jam (mixed with sherry or other liquor), really more of a tart than a pie. The chef at Bon Appetit made a filling of apple and fennel, which I really liked. Perhaps the best pie of all though (below) was the lovely treat of four teensy Lillipies that contest organizer (and professional baker) Jen Carson sent home with us judges (to be enjoyed in solitary splendor if your’re lucky!). There were two kinds, apple and chocolate. The crusts were tasty and still crispy too! 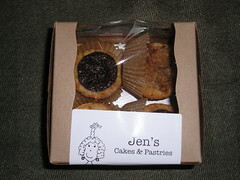 Visit Jen’s website and check out her gorgeous pastries and cakes (including wedding cakes). And these little pies? Perfect for graduation parties!